Issue #61 of Mutiny zine has hit the interwebs. Of note is an interview with a Greek hound and a report of a surreal attempt by a policeman to get involved with Jura (Sydney). The Dole Army was a classic hoax perpetrated by some Melbourne anarchists in 2002. Sunday August 7: 12:00pm meeting, 1pm poster run. 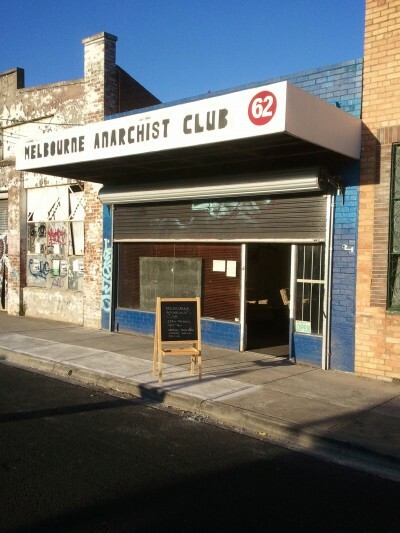 Some members of MAC have come together to form a working group around spreading anarchist propaganda in Melbourne. We want to spread radical ideas in artistic and creative ways: posters, art, stickers, publications distribution, and anything else you can think of. All those interested welcome to attend. 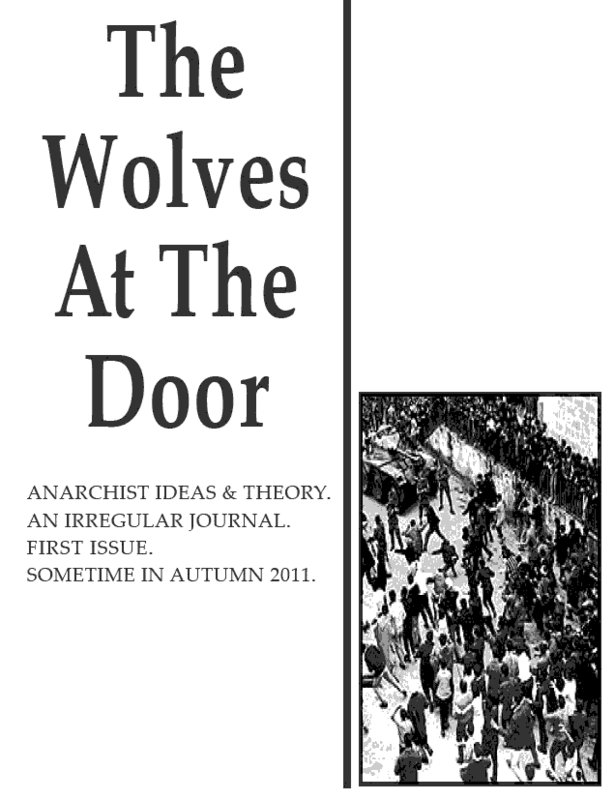 The Wolves At The Door is a new and irregular journal coming out of the anarchist crew in Sydney. 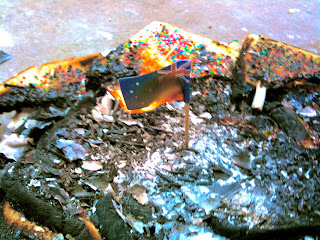 Is One Day of Democracy Enough? This Sunday from 5pm some of the comrades have decided to start up the Fantin Reading Group again, with a session on the topic of voting and state elections. Very topical! I'm sure we'll all be ready for a dose of political reality after Saturday's election. The readings aren't on the blog just yet, but can be found on the MARC Announce list (including a funny one by Adam Bandt, check it out). All welcome. 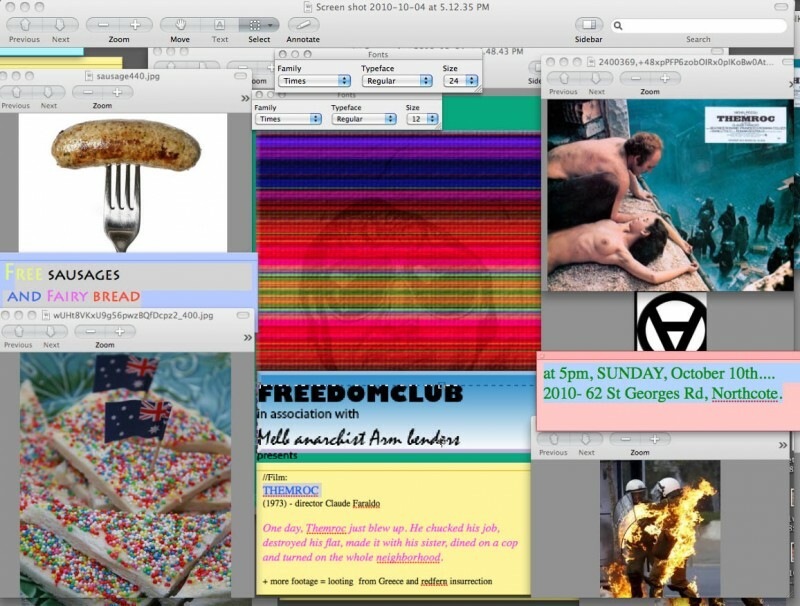 Melbourne Freedom Club presents film screening, performance, talk. New anti-squatting law introduced on October 1, 2010. Film and disco re resistances.